In a recent article we spoke about the vast terminology used in gambling. The last two meanings in particular, ‘rate’ and ‘price’, are probably the reason why the expression ‘value’, when used in the context of ‘value betting’ is often unclear, let’s look at it from a very simple perspective. 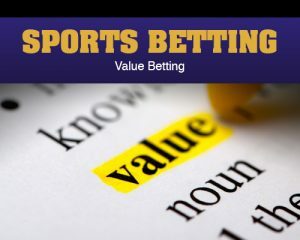 The ultimate key to successful sports betting is to obtain value on every bet, and in this context value refers to better than “true odds” on a team. It means betting when you esteem the risk: reward ration as being heavily in your favor and that can often mean betting the underdog. For example if after doing some research for a particular game you conclude that the underdog should be receiving 3.5 points, but is receiving 6.5pts, then that is a value-betting proposition, also called an “overlay”. Regularly people have concerns to bet on underdogs, the simple idea of backing the weakest team doesn’t resonate with many, particularly new bettors, but the important thing to consider is that a relatively poor team receiving a large point spread does not actually have to win the game, just lose by less than the points it is receiving. And they frequently do because the better team is only interested in winning and reducing the risk of injury, not covering the point spread. In football in particular minor changes in spread have major implications for value, there are key numbers, pay especial attention to 3,4,6,7 and 10. A small 2 point move in a line is not as small for value purposes, changing a line from 6 to 7.5 is a major move. An interesting fact is that in Football more games are decided by a margin of 3points than by any other margin. Therefore, a point spread of 2.5 to 3.5 is critical to the smart bettor. In simple words the concept of betting value is when you determine that an outcome is more likely to happen than the probability implied by the bookie’s odds, in such case you would be getting a value bet. Learn more about sports betting, get in the action today at RegalPoker.com! Get all the latest Sports Betting and Poker updates on your social media outlets. Find us on Facebook!